If you are interested in web design/programming service, youre welcome to contact us. We provide something for everyone; From web design & eCommerce/hosting/programming solutions to search engine optimization (SEO), pay per click (PPC) management and online marketing for small, local businesses to fortune 500 companies. Whatever your online needs might be, theres very big chance that we have the expertise to provide it for you. We give our clients the benefit of our years of experience on the Internet, having been involved since 1993. We pride ourselves in our ability to provide constant customer support coupled with reliable service. 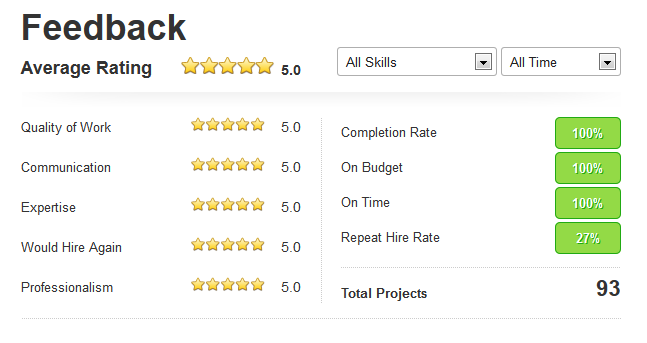 We are also one of the top freelancers on Freelancer.com, and our (perfect) feedback speaks for itself. Our reputation on Worlds largest freelance marketplace based on 93 completed projects with perfect (5 out of 5) rating, with almost 30% repeat hire rate. Do you want to be freelancer; need one? Were not forcing anyone to work directly with us; in fact, were supporting everyone! Even our competitors, cause well always be able to withstand competition with quality of work. SL and GAF have earned a good reputation over the last decade, and they are definitely websites that you can fully trust – and trust is most important factor wherever money is involved. As a buyer, you will learn that web development doesn’t have to be expensive – outsourcing will seriously cut your expenses. Just be careful who you pick to complete your project. Suggestions to all (future) buyers would be to always describe your project well – it’s better to communicate before the project starts cause it minimizes the chance to waste words at a later point, if freelancer doesn’t understand your needs well. Also, define your budget well and once again, make sure to speak with freelancers before you pick them – ask for demos (yet have in mind that people sometimes can’t provide too much for a demo as its free) + check reviews as feedback is good base to conclude whether person is good worker or not + rely on everything you are able to rely on. You have all that is necessary, in technical terms – rating system, private message board etc. Check those two sites everyday, it’s all a matter of seeking-bidding-discussing-working (with a lot of talking/writing) – as full time freelancer I spend at least 2 hours per day just to browse sites and find projects I’m interested in. I enjoy the benefits of working from home, and there are many – no stress, no angry boss above your head, no waking up at 6 am, no fixed working schedule, no backstabbing coworkers etc. — you’ll experience all that as long as you are serious. There’s plenty of work available there, but I really suggest that you bid and accept only projects that you CAN complete at your best; satisfied customer means plenty of joy! Remember that buyers review us and always strive to earn 10 out of 10 rating — it’s a bit hard at the beginning cause we all start with 0 reviews – try to win few easier projects and impress buyers no matter that its not high paying project. Always exchange feedback – the purpose of feedback system is to support & maintain quality and as long as you are professional worker with unique skill set, you have nothing to worry about — after you get couple of excellent reviews, youll notice that webmasters will pick you much more often as theyll be able to rely on your past work and (hopefully, great) experience that other people had with you.